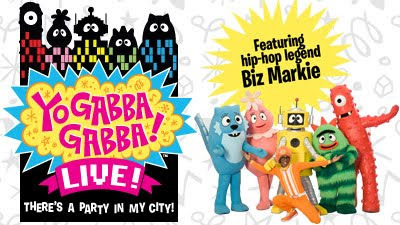 Yo Gabba Gaba, the popular kid's television show, is coming to stage near you! Yo Gabba Gabba! Live! There's a Party in My City! will be playing at the Citi Performing Arts Center Wang Theatre in Boston in September. Special for Aquarium members, purchase your tickets before they go on sale to the general public! Our members can buy advance tickets to this hip production Wednesday, June 2, through Thursday, June 3, at 10 p.m. only. Tickets go on sale to the general public on Friday, June 4. Follow this link to purchase pre-sale tickets. Click the gray button next to ticket button to enter promotional code: YGGNEAQ. Fresh off a triumphant sold-out tour debut, a headlining performance at the White House, a chart-topping album and an appearance at Coachella, DJ Lance Rock and the cast of YO GABBA GABBA! are heading back on the road with YO GABBA GABBA! LIVE! : THERE’S A PARTY IN MY CITY! to play to enthusiastic fans in Boston, including you, our Aquarium members!